For decades, APA Rated Siding products have been lending strength and beauty to contemporary residential and light commercial buildings. APA Rated Siding panels and lap siding are structural products produced with known and reliable strength and stiffness properties. Siding panels can be applied direct to studs or over sheathing. APA Rated Siding products are manufactured from a number of different species and are available in configurations such as reverse board and batten, T1-11, channel groove and other common finishes. These attractive panels can be stained or painted and offer a cost-effective and attractive exterior for contemporary structures. 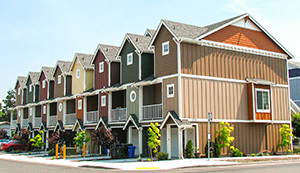 For more traditional architectural styles, lap siding products are also available. 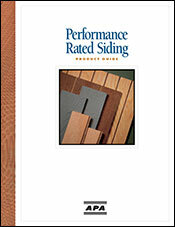 For further details on APA Rated Siding, refer to the Product Guide for Performance Rated Siding, Form E300, which covers face grades, textures and patterns, finishing and refinishing, how to order and specify, and basic application recommendations. View additional related publications on siding, including case studies, technical sheets, builder tips and more. Eagle Plywood Specialties Roseburg Forest Products Company Hardel Mutual Plywood Corporation Georgia-Pacific Wood Products LLC Hood Industries, Incorporated RoyOMartin Pacific Wood Laminates, Inc. Swanson Group Mfg. LLC.